Lately I have been exploring many useful tools online. One of which that has popped up a lot in my twitter stream that I have been utilising in my classroom is EdPuzzle. 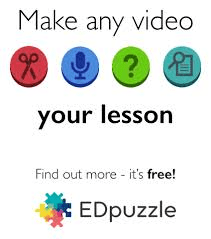 EdPuzzle is a FREE and easy way to make any online video your lesson. It allows you to clip and chop videos to suit your lesson and to add your own bits to tailor it to your needs. I have been using EdPuzzle to help consolidate my classroom teaching and to support my role of integrating technology across all year levels. It allows you to add voice and questions as a teacher and even has potential as a student driven tool to get students responding to problem based questions and problems to check for understanding in an interesting way. I love the fact that the creators of EdPuzzleare keeping it FREE. They are doing it for the love of education and it is a tool that is revolutionising the way I teach. I have only been using it for 2 weeks but I can see huge benefit with the current trend of ‘Flipping Classrooms’. I love that you can search for educational videos from youtube, Khan Academy, Learn Zillion, National Geographic, Vimeo plus much more. I have been working on adding a selection of questions that pop up as the video plays. Very cool tool that I am hoping to continue utilising. The latest updates on the site allow you to embed assignments or videos in an LMS which is brilliant and teachers can now prevent their students from skipping parts of the video (very useful). From my experience on Twitter there are a lot of products (good and bad) shared around. I only like to share those products that I use in my classroom and that I can see other teachers utilising. EdPuzzleis one of those tools. My next step is to get our Middle School English classes using this as a tool to review videos / books in an online environment. By signing up to a free account you get access to their workshop materials, video-tutorials, free swag and blog posts.